If you want an insight into somebody's true personality, then try to catch a glimpse of the way they sleep. 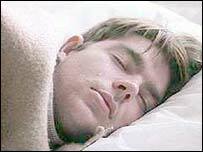 Scientists believe the position in which a person goes to sleep provides an important clue about the kind of person they are. Professor Chris Idzikowski, director of the Sleep Assessment and Advisory Service, has analysed six common sleeping positions - and found that each is linked to a particular personality type. "We are all aware of our body language when we are awake but this is the first time we have been able to see what our subconscious posture says about us. "What's interesting is that the profile behind the posture is often very different from what we would expect." The Foetus: Those who curl up in the foetus position are described as tough on the outside but sensitive at heart. They may be shy when they first meet somebody, but soon relax. This is the most common sleeping position, adopted by 41% of the 1,000 people who took part in the survey. More than twice as many women as men tend to adopt this position. Log (15%): Lying on your side with both arms down by your side. These sleepers are easy going, social people who like being part of the in-crowd, and who are trusting of strangers. However, they may be gullible. The yearner (13%): People who sleep on their side with both arms out in front are said to have an open nature, but can be suspicious, cynical. They are slow to make up their minds, but once they have taken a decision, they are unlikely ever to change it. Soldier (8%): Lying on your back with both arms pinned to your sides. People who sleep in this position are generally quiet and reserved. They don't like a fuss, but set themselves and others high standards. Freefall (7%): Lying on your front with your hands around the pillow, and your head turned to one side. Often gregarious and brash people, but can be nervy and thin-skinned underneath, and don't like criticism, or extreme situations. Starfish (5%): Lying on your back with both arms up around the pillow. These sleepers make good friends because they are always ready to listen to others, and offer help when needed. They generally don't like to be the centre of attention. The remainder of those in the poll said the position they fell asleep varied or did not know. Professor Idzikowski also examined the effect of various sleeping positions on health. He concluded that the freefall position was good for digestion, while the starfish and soldier positions were more likely to lead to snoring and a bad night's sleep. Professor Idzikowski said: "Lying down flat means that stomach contents can more readily be worked back up into the mouth, while those who lie on their back may end up snoring and breathing less well during the night. "Both these postures may not necessarily awaken the sleeper but could cause a less refreshing night's sleep." The research also found that most people are unlikely to change their sleeping position. Just 5% said they sleep in a different position every night. Professor Idzikowski also found that one arm or leg sticking out of the duvet is Britain's most common position, followed by both feet poking out the end. One in ten people like to cover themselves entirely with the duvet. "Psychologists say we are creatures of habit when it comes to sleep"